New for 2018 artificial hedges…yes hedges. Looking for something different how about artificial hedges. Low maintenance, hay fever free, fire retardant and various designs. JRD Landscapes are a professional and skilled landscaping team with over 22 years experience in supplying and laying artificial grass in Glasgow and surrounding areas. Our landscape gardeners can undertake all aspects of landscaping, artificial turf laying, and Pvc-u fencing for house builders and home owners. This low maintenance grass has improved over the years and now comes in many different grades, such as short putting green grass or long woodland grass, making artificial lawns a great option. 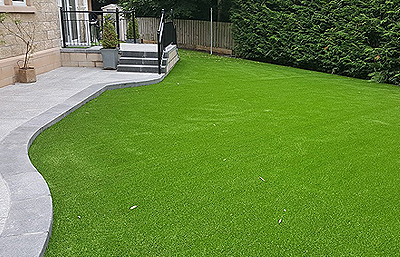 Artificial grass is a safe, clean and child and pet friendly surface that's in expensive to install, that many households, golf clubs, sports centres in Glasgow as well as School playing pitches and Childrens Nurseries are now getting them. Have a look at our extensive gallery of artificial grass surfaces and see for yourself. Why choose artificial grass and PVC fencing for my garden over real grass and timber fencing? This is the most common question we get asked on a regular basis. The main benefit is that installing a artificial lawn and fencing means that this virtually maintenance free solution is perfect for modern day busy lifestyles. This means you will never have to cut the grass again, never have to stain the garden fence again and never have the continuous expense of doing so. Artificial grass and fencing has come a long way in the last 10 years with both artificial lawns and fencing looking like the real thing. You really wouldn't know your garden lawn is artificial or real, it's that good. A lot of homeowners have poor drainage in their gardens, which means it's a major challenge to grow real grass. Other people want both real grass and artificial grass in their garden. In one case one of our customers had their front garden turfed with real grass and artificial turf installed in the back garden. The reason for this was he wanted a putting green in the back garden and the only way of achieving this was to have artificial grass installed. A common question we get asked is: Can you lay artificial grass on decking? Well the answer is simply - yes. Garden decking has been a popular choice for households over the past 20 years. It gives you an area in your garden that you can enjoy not only visually but functionally to. Wood garden decking does need yearly maintenance though, and if the decking wood is left untreated it can often discolour and become slippery especially in the wet. This is why a lot of people now choose to install artificial grass on decking, as it gives the garden decking area a new lease of life as well as being pleasing to the eye. Have a look at JRD Landscapes artificial grass on decking picture below. 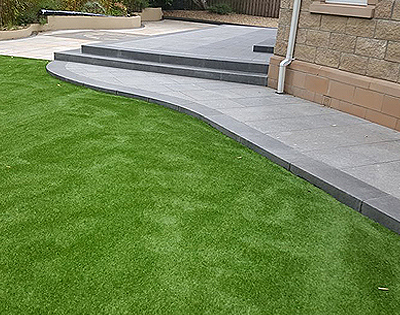 JRD Landscapes can offer you a guaranteed supply and installation service on all artificial grass and fencing throughout Glasgow and the surrounding areas. We will visit your property and survey the area and offer a free no obligation quotation. Make the most of your front and back garden with our tough, durable quality artificial grass. We have many different grades of artificial turf to create your perfect lawn. With todays technology artificial grass is so realistic it's very hard to know if it's real or not. We can instantly rejuvenate your existing grassed area to a lawn of perfection. 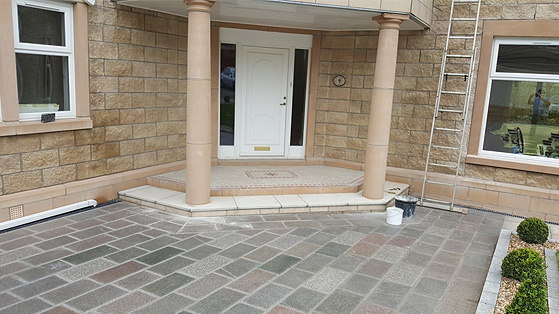 Due to increasing wet weather this low maintenance option is fast becoming the must have for many homeowners in and around Glasgow and the West of Scotland. 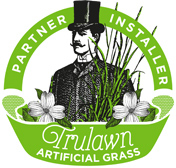 JRD Landscapes are Official Installers for Trulawn Artificial Grass. 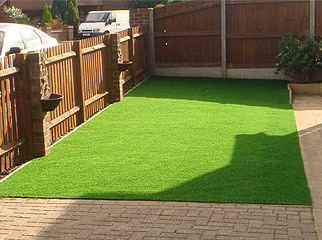 Trulawn supplies the most true-to-life artificial grass available in the UK. With Trulawn artificial grass you don’t need to be green fingered to have a gorgeous garden! Using Trulawn products JRD Landscapes specialise in transforming front and back gardens with the highest quality artificial grass that looks and feels as good as the real thing.